We all knew that Microsoft was saying goodbye to the Nokia branding for it’s Windows Phones and that day has finally arrived. The first handset to arrive without the Nokia label is the all new Microsoft Lumia 535, a low end device aimed at the low budget market but it does arrive with some nice features. The two standout features are it’s 5-inch display and 5 megapixel front facing camera. 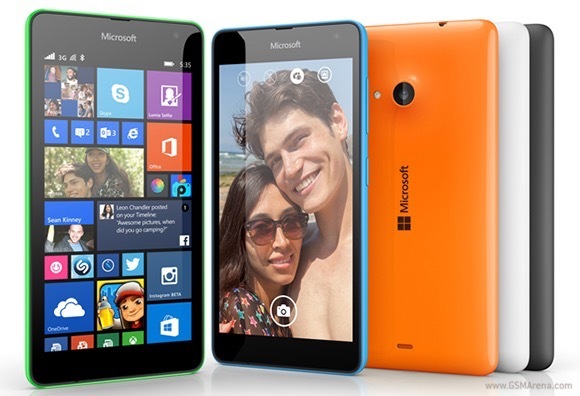 The Lumia 535 arrives with a plastic back much like it’s predecessor but it has slimmed down quite a bit. Microsoft has said that the Lumia 535 has been designed as an alternative to it’s smaller Lumia 530 with them main target markets being in Russian, India, China and Asia. We won’t see this in the the UK for a while according to Microsoft and those in the US won’t see it at all. If you want to find out more then be sure to visit Microsoft’s website.